Last fall, I picked up a copy of Mark Bittman’s then-new book, The Food Matters Cookbook. I was feeling like my diet needed a bit of a shakeup, and I was drawn to Bittman’s philosophy, which essentially boils down to the idea that meat can and should be used as an ingredient, or a garnish, in a dish rather than as the main event. I love meat and can’t see myself going the vegetarian route, so the ideas and recipes in Bittman’s book struck a chord with me. Of course, I also have a bad habit of buying cookbooks, flipping through them, and then promptly putting them away in my kitchen and forgetting about them for an extended period. This one suffered such a fate until I pulled it out this weekend for a look and something caught my eye that I’d never tasted, and frankly didn’t even realize was possible—seared watermelon. 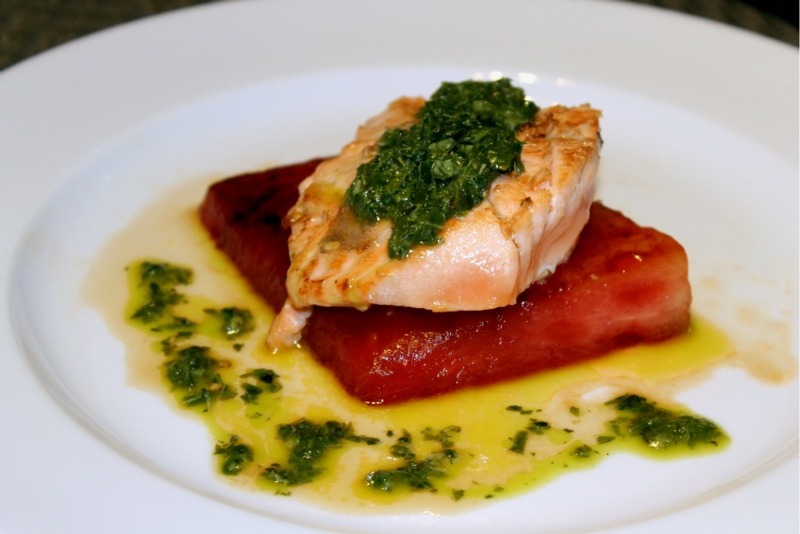 In Mark Bittman’s recipe, the seared watermelon was used as a base for a Japanese-inspired fish dish. He wrote that the watermelon took on a substantial steak-like texture when it was seared, as the water was pulled out of it. 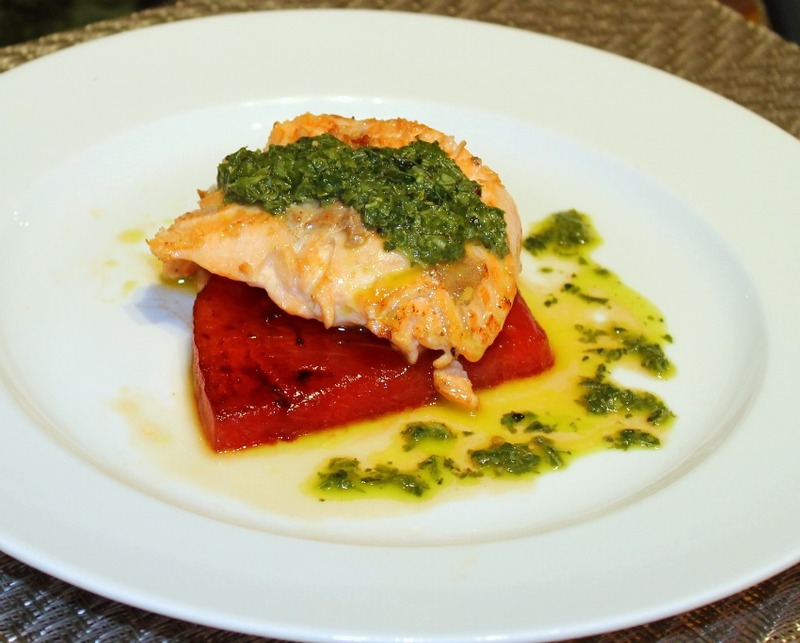 I knew I needed to try this, but in my mind, I saw the watermelon paired with salmon (rather than the simple white fish Bittman recommends) and topped with a simple, fresh mint and basil chimichurri, since the flavours of watermelon and mint go so great together. Jenny and I both agreed that this really turned out amazing. 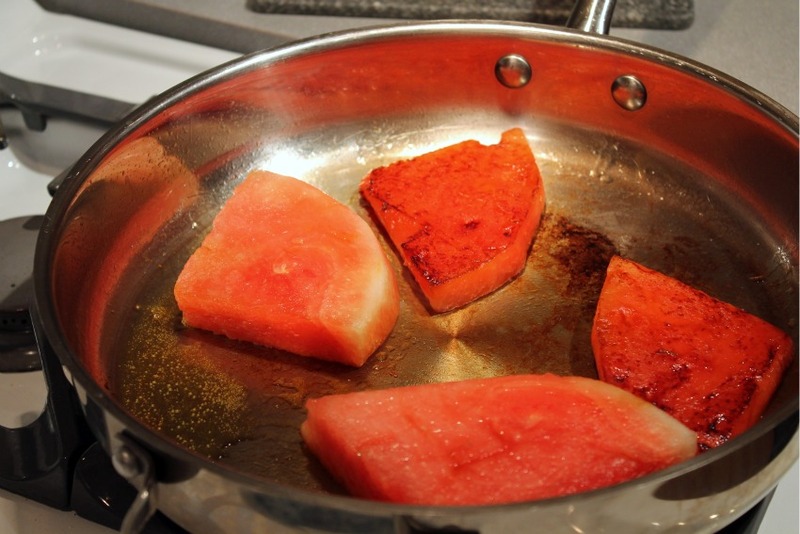 In addition to becoming less watery and firmer when seared, the sugars in the watermelon also caramelize in the pan, which adds a bit of a burnt sugar element. And while this looks like an elaborate, composed dish on the plate, it came together in no time at all—perfect for a weeknight. Place all ingredients and half the olive oil in a food processor. Pulse for a minute or two until leaves get chopped and ingredients are well blended. Add more olive oil as needed, depending on desired consistency (less oil for a thicker chimichurri, more for a thinner one). Slice watermelon an inch or two thick and remove the rind. Season slices with a pinch of salt. Heat a metal pan coated with a small amount of olive oil over medium-high heat for several minutes. 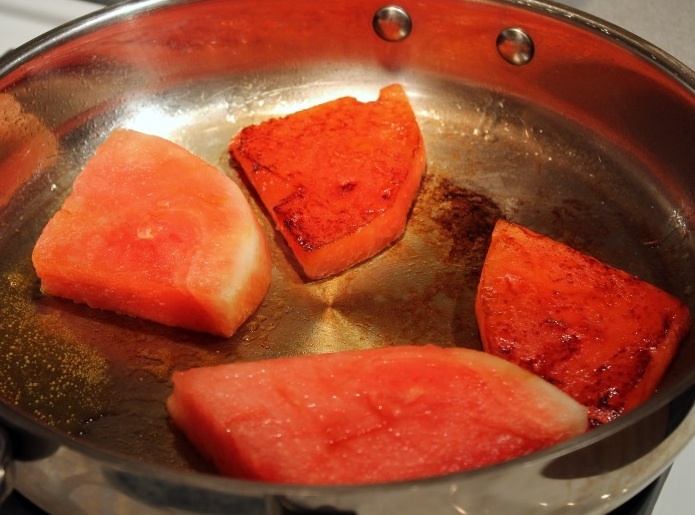 When oil begins to sizzle, place watermelon slices in pan. Leave to sear for two minutes or so, until it begins to brown, then flip and cook another two minutes on the other side. Remove from heat and set aside on a plate. Season individually portioned salmon fillets with salt and pepper. Sear on both sides in a hot pan until cooked, a few minutes per side. To plate, place a slice of seared watermelon on a plate, top with a salmon fillet, then drizzle chimichurri overtop the salmon.